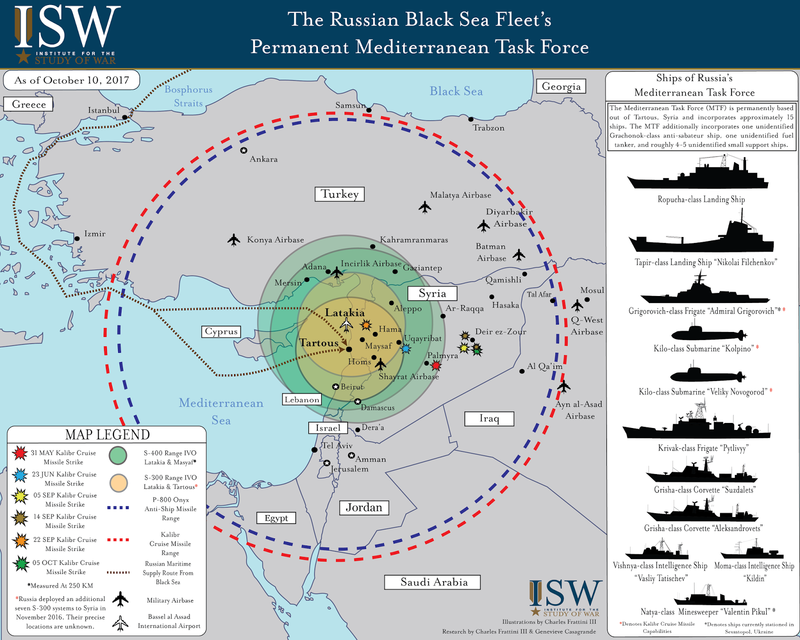 Key Takeaway: Russian President Vladimir Putin continues to leverage uncontested basing in the Eastern Mediterranean to demonstrate Russian naval capabilities, while asserting its freedom of action on NATO’s southern flank. Russia focused on showcasing the increased cruise missile capability of its Black Sea Fleet’s permanent Mediterranean Task Force (MTF) from August – October 2017. The Russian Ministry of Defense announced on August 25 that both sea and airborne cruise missiles were successfully utilized during a coordinated attack on ISIS positions for the first time since Russia’s entry into the Syrian Civil War in September 2015. Russia deployed two previously non-combat tested submarines to its Tartous naval base along the Syrian coast on August 28, signaling Russia’s continued prioritization of combat experience for the MTF. The two submarines later executed their first combat operation with Kalibr cruise missiles against ISIS in Eastern Syria on September 14. September marked the highest frequency of Russian Kalbir cruise missiles strikes in a single month in 2017. 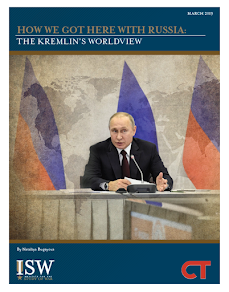 The Kremlin meanwhile demonstrated its continued desire to challenge U.S. and NATO forces in the Mediterranean through the deployment of additional naval vessels and a second S-400 long-range air defense system to Syria. Russia briefly deployed the Admiral Grigorovich to the Syrian theater under the guise of participation in a bilateral cultural festival between Russia and Greece from September 27 – October 1. The Admiral Grigorovich cut its deployment short and rotated back to Sevastopol in Russian-occupied Crimea (Ukraine) on October 4, likely due to mechanical error. The Grigorovich has routinely rotated between the Black Sea and the Mediterranean since June 2016. Moscow’s expanding footprint in Tartous underscores the Kremlin’s intent to use its positions on the Syrian coast to establish Russia as a permanent regional power and challenge the Unites States and NATO in the longterm. 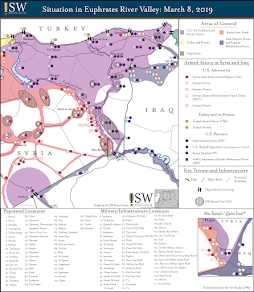 Charles Frattini III and Genevieve Casagrande, “Russia’s Mediterranean Threat to NATO, Institute for the Study of War, July 13, 2017, http://iswresearch.blogspot.com/2017/07/russias-med-threat-to-nato.html.